Phonetics bites have been long been a standard method used by dentists who needed to find a upper to lower jaw relationship when fabricating prosthetic dentures for their edentulous patients. Some have reported the “Phonetic Bite” as a peer reviewed technique for taking a bite registration”. 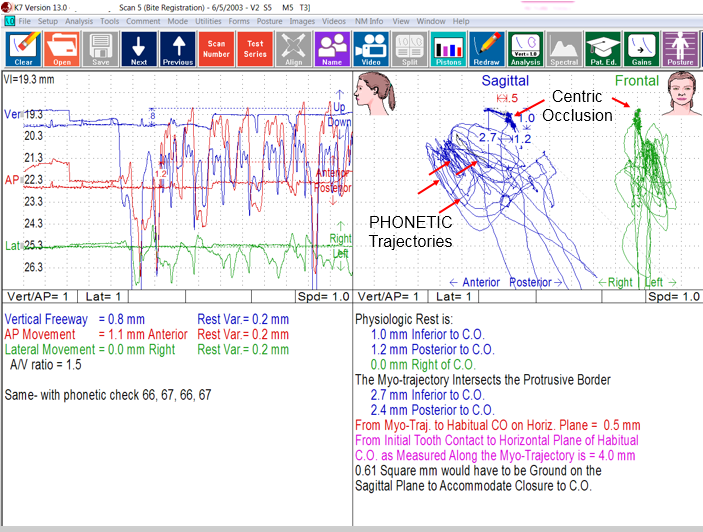 Dentists who have been using jaw tracking technology (Myotronics K7, kineseograph with low frequency TENS) have been able to accurately record various habitual, neuro-muscular as well as functional phonetic mandibular jaw positions relative to the patients centric occlusion (CO) in order to identify positionaly the different bite registration techniques for consistency and accuracy related to different occlusal philosophies. 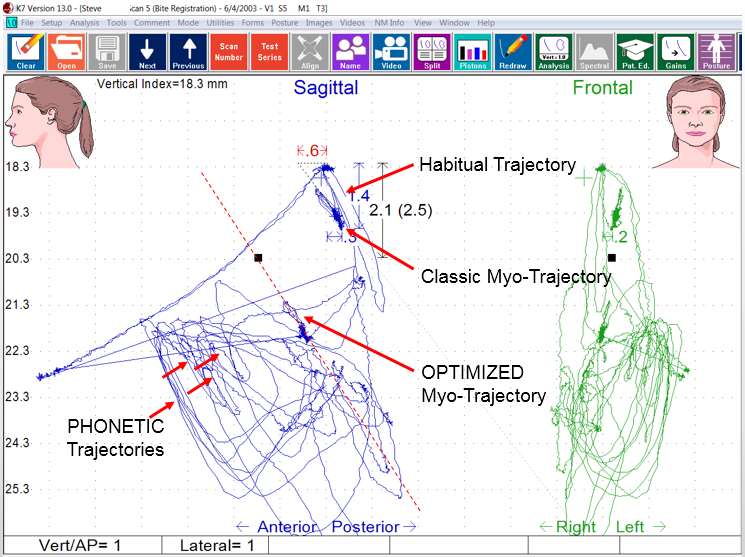 Below is a K7 jaw track showing in the sagittal and frontal views a patients mandibular movements and position relative to CO. Habitual open and close (habitual trajectory), a classical “myo-trajectory” after low frequency muscle relaxation position with TENS (classic myo-trajectory), and Optimized myo-tractory following Dr.Chan’s protocol and various phonetic bite trajectories as noted below. Uses of phonetic sounds like, “San Francisco” or “Mississipi” or even “66, 67, 68, 69” were some of the more common phonetics sounds that were recorded. Phonetics sounds 66, 67, 68, 69 were used and recorded below. Phonetics was also used and compared to a more “optimized bite” positioning following the Optimized Scan 4/5 myo-trajectory following the Chan protocol as comparison. When comparing the Optimized myo-trajectory using the K7 Scan 4/5 following the GNM principles and protocols as per Dr. Chan the trained dentists who have come to Occlusion Connections for training have recognized that the optimized TENS protocols combined with the objective science and use of the K7 has proven beyond a reasonable doubt to themselves of the effectiveness of each bite registration technique. 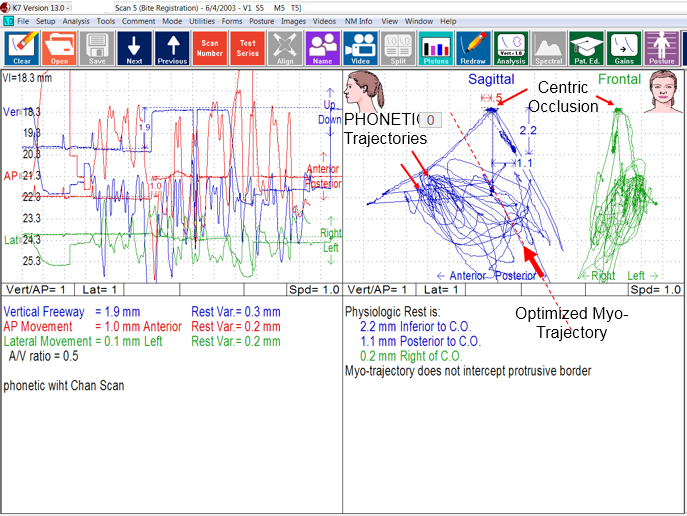 One day more dentist will realize the important and significance of identify and locating the Optimized Myo-Trajectory of their patients when recording bite registration. Relaxing muscles with low frequency TENS first prior to any occlusal adjustments, equilibration or modification of any occlusal relationship is fundamental and key to treatment success to remove muscle torques and strains. Aberrant muscles can pull, torque, twist and skew a jaw relationship during bite registration and or occlusa adjusting procedures. Question: Is the phonetic bite technique a reliable method for patients who have an aberrant tongue habit or strained muscles during bite recording?